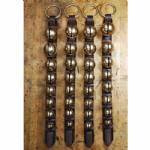 We divided the owner's 32 petal bells as evenly as possible among four display straps. The owners wanted to divide their heirloom bells so they could give a keepsake to each of their adult children. The bells range from a #11 or #12 bell (2 3/8" to 2 1/2" across) at the top to a #2 bell (1 1/4" across) at the bottom. The petal bells date to the mid to late 1800s. More about petal bells... Each strap is about 27 inches long from top to tip. The leather is 1 1/2 inches wide.